The two most popular kinds of balusters are wood and wrought iron balusters. Both styles provide the structural support you need for a safe and code compliant stairway, but there are some important differences to keep in mind. 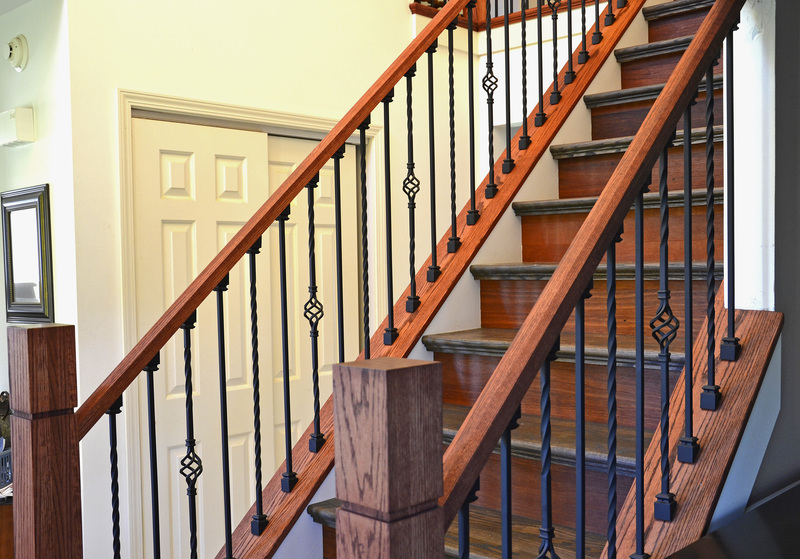 If you’re aiming for a traditional look for your home, wood balusters are the perfect choice. Thanks to a wide variety of turned and blocked shapes, wood balusters offer a multitude of design options. In most cases, wood balusters are styled with a square block section at the bottom of the baluster, while the top is intricately turned for a classic look. The top of the baluster either tapers upwards or transitions into another blocked section as it reaches the handrail. With StairSupplies™ wood balusters, you can choose between contemporary and traditional cuts. Though subtle, this styling choice is significant. As demonstrated in the image, the difference is in the height of the square wood base at the bottom of each baluster. 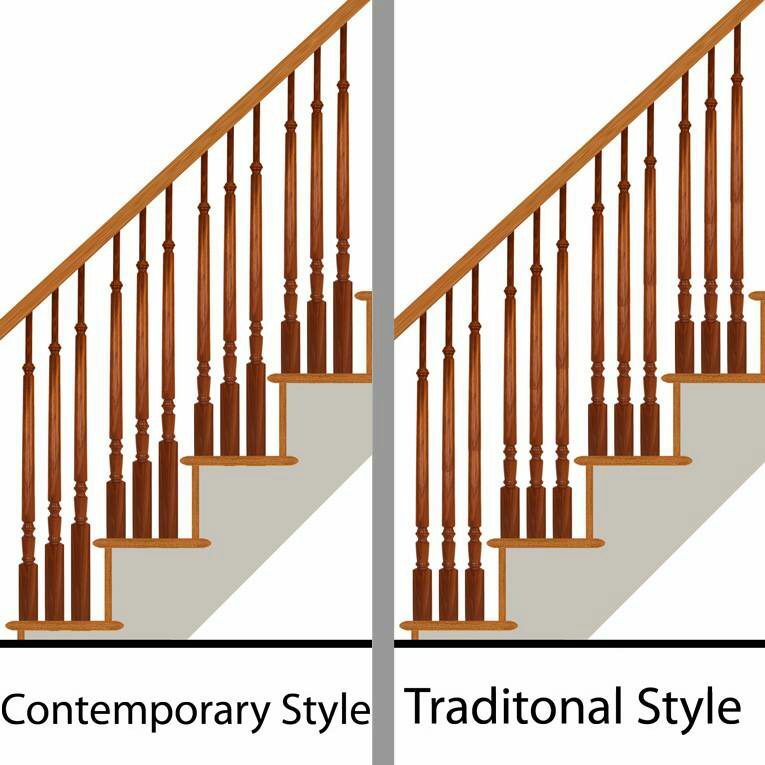 The contemporary style matches the same slope as the handrail, and the height of the bottom wood block is adjusted for each baluster. This means each detail of the baluster flows from the bottom of the stairs all the way to the top. The traditional style, on the other hand, appears more measured and sectioned. The base blocks are the same size on every baluster, so the block height is level on each tread. Not only can you play around with the shapes of wood balusters, you also have the opportunity to pick from a wide range of wood species and finishes. StairSupplies™ offers both primed wood for painting and stain grade wood balusters. Lighter wood species and stain options provide an antique, established look. Find a more modern aesthetic with darker finishes. And don’t forget the option to paint – white or off white wood balusters can look very clean and polished. Paint them black for a sophisticated and contemporary twist. Classy and sophisticated, wrought iron balusters add timeless elegance to any stairway. With delicate twists, sweeping scrolls, or graphic shapes, iron balusters add strength and durability to your stairways and balconies. Like wood balusters, there is a large selection of styles available. At StairSupplies™, we offer 9 different series of iron balusters in designs ranging from sophisticated to edgy. Many of these have iron newels to match, but they also pair well with wood newels, like Turned Newels or Box Newels. When it comes to designing with Iron Balusters, many prefer to mix-and-match different styles to make a unique pattern. Of course you can use the same iron balusters for your whole project, like you might with wood balusters, but creating patterns is a great way to express your design aesthetic and make your newels stand out. It can be a little tricky to imagine how different iron balusters might look together – try out your design on the Iron Baluster Design Tool as you dream up different patterns and designs. Iron balusters are available in two different compositions: solid and hollow. 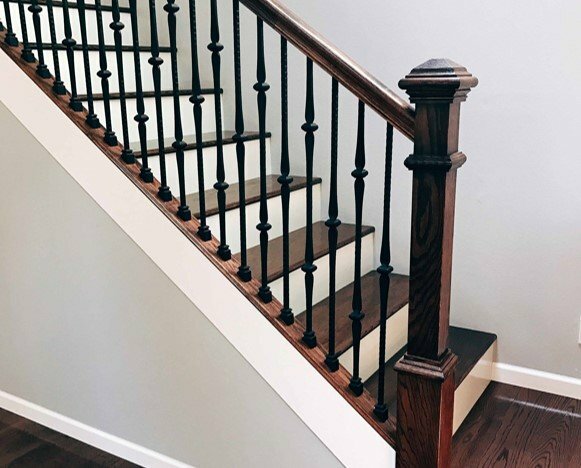 Both provide strength and a variety of styling options – read more about the benefits of each in our blog Solid or Hollow Iron Balusters – Which are Right for You? When it comes to colors, iron balusters can really pack a punch! If you like a more rustic look, you might enjoy Antique Bronze or Brushed Bronze. Interested in high-fashion elegance? Try Ash Grey, Silver Vein, or Antique Nickel. Our universal favorites are Satin Black, Oil Rubbed Bronze, and Oil Rubbed Copper – they go well with so many design approaches! 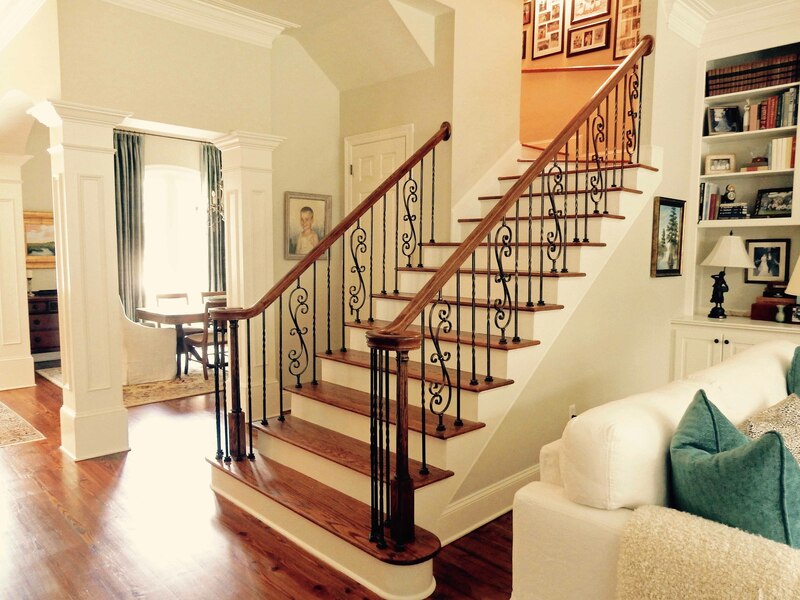 Project #254 - A recent winner of our photo contest, this homeowner created a beautiful example of what scrolled iron balusters can do to your stairway… open, elegant, and inviting. They selected the brushed bronze finish for an extra level of flair. Project #258 - Powerful with a hand-forged look, these gothic style iron balusters create beautiful negative space thanks to a pattern of single and double knuckles. Shoes at the base of the iron balusters give it a grounded look. 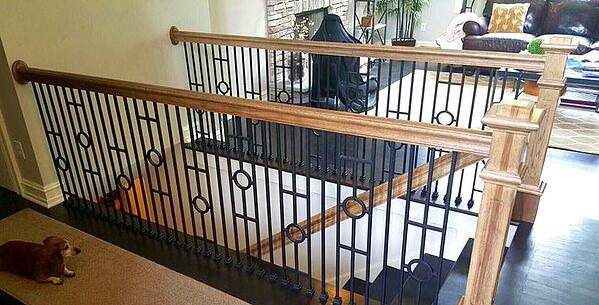 Project #222 - Designer Series iron balusters pop in this simple railing project. The alternating height of the circle accents makes a subtle and pleasing pattern. We also think they look divine with box newels. Project #244 - There’s so much to love about this versatile design! These homeowners used 3 styles of iron baluster: plain straight, long twist, and single basket iron balusters (from the Twist Series) to create a timeless stairway. They opted to install shoes on both the top and bottom to tie the look together. Explore these projects and more on the Completed Projects page. When it comes to stair and railing projects, you can trust StairSupplies™. We’ve been creating high-quality stairs since 2001 and we're always thinking of new ways to serve your stair needs. Explore our resources and fill out a Design Help Form to get started. Or, give us call if you have any questions. We can’t wait to see what you create!